On Friday I met the amazing Dawn Fidler at our bakery in Eccles to discuss ways in which we could help Dawn raise even more money for her work in helping families who have children with brain tumours & post surgery disabilities that need advice, support & financial solutions. Dawn’s son Joshua Wilson aka SuperJosh was a very happy normal 3 and a half year old when he was diagnosed with his tumour; lifesaving brain surgery left Joshua in a coma for 3 months before he then started his recovery in rehab – the complicated surgery due to the location of the brain stem left him with complex physical needs, epilepsy, scoliosis, joint problems and an acquired brain injury. Dawn and her husband have been through an amazing journey with their son and have learnt so much about the illness and have had family and friends help them through their worst moments, that they want to help other families who are suffering this awful illness. We are going to support this very worthwhile charity throughout the year with different fund raising support. 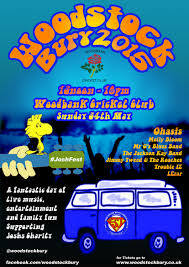 First of these will be the Woodstock Bury event on Sunday May 24th 2015. Hopefully the event will be extremely well attended as it promises to be a good day with lots of local bands performing and a lot of volunteers and people giving their time to help raise as much money as possible. We will be donating the baps for the burgers and the finger rolls for the hot dogs, there will be an afternoon tearoom as well where you can buy our scones with a cuppa and also we are hoping that they raise more money by selling our Bakestone loaf, with 100% of the proceeds being for superjosh charity.